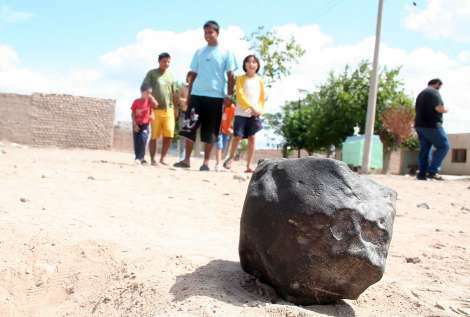 Yesterday the people of Santa Lucía were surprised when a black porous rock fell from the sky. Today the CASLEO (Astronomic Complex El Leoncito) is analyzing the rock to determine if it is a meteorite or not. "It was like a fire ball that traversed the sky", several witnesses said yesterday. Profesor Eloy Actis, director of the Observatory Félix Aguilar, is between those who do not believe it is a meteorite because he claims "that it should weight more than 20 kg, when in reality it is only a rock of only 2 Kg. It could be a volcanic rock, but due to the area where it fell, this will be highly unlikely."